The majority of the attention paid to the regular cavalry during this battle quite rightfully goes to the 4th U.S. Cavalry, but I wanted to post this report for inclusion in the record as well. Company C, 2nd U.S. Cavalry, commanded by Lt. Charles Farrand of the 1st Infantry also participated in the battle as well. At least one of the enlisted men mentioned will be appearing in a future post. Captain: I have the honor to report that on the evening of the 9th of August I received verbal orders from General Lyon to report with my company for duty to Colonel Sigel. I reported to the latter at 6 o’clock that evening, and by his order formed with my company the rear guard of his column, which immediately proceed towards the (end pg 90) enemy’s camp. While on the march Colonel Sigel directed me to act on the right when the enemy should be engaged. Afterwards, however, this order was countermanded, and I was directed to take my position on the left. Nothing of importance occurred on the march until about 4.30 in the morning, when several prisoners were tuned over to the guard. One of these stated to me that their army was expecting re-enforcements from Louisiana, and that they had mistaken us for their re-enforcements. We were now very near the enemy’s camp, and continued to take prisoners in small numbers, most of whom said they were out in search of something to eat. At about 5 o’clock I was ordered with my company to the front. Soon after I reached the head of the column, a small party of men and horses was discovered in a ravine through which we were approaching the enemy’s camp. These I was ordered to take, as they were supposed t be the enemy’s picket. I advanced with a small party upon them. They discovered me ata distance, and mounted their horses. I did not succeed in taking the party prisoners, but cut them off from their camp, which was now in plain sight. I with my company now took my position on the extreme left, and the command moved steadily forward without having been discovered by the enemy, although very near, and at some points in plain sight of, their camp. The attack was opened by the infantry on the center and left, and soon responded to by the artillery. It was but a moment before the camp was entirely cleared, and as we passed through it I saw many dead bodies and quantities of arms of al descriptions lying on the ground. Many of the latter I caused my men to destroy. There were in their camp a wagon load of Maynard rifles, of the regular rifled muskets, and several boxes of United States regulation sabers, all new. There being no enemy in sight, I was ordered to move along the south side of camp. I was in a few minutes after ordered to return and support Colonel Sigel’s battery. When I reached the battery I discovered an immense body of the enemy’s cavalry forming in a field about 7000 yards in front of our position. The battery immediately opened on them with considerable effect, and forced them to retire. A large body of the enemy’s cavalry, who had dismounted and deployed in the brush on the south side of the field, were driven back and obliged to leave their horses. My company was on the field until Colonel Sigel’s forces retired, but as circumstances were such as to render it impossible to use cavalry, we did no particular service. Upon finding myself with the company alone, I retired in a southerly direction, and accidentally meeting one of the guides who had been employed in taking us to the enemy’s camp, I forcibly detained him until I could collect some of the troops, whom I found scattered and apparently lost. I halted my company, and got quite a number together, and directed the guide to proceed to Springfield, via Little York. Affter proceeding a short distance we came upon one of the pieces which had been taken from Colonel Sigel. Although the tongue of the limber was broken, one horse gone, and one of the remaining three badly wounded, we succeeded in moving it on. Some distance in advance f this we found a caisson, also belonging to Colonel Sigel’s battery. I then had with me Sergeant Bradburn, of Company D, First Cavalry; Corporal Lewis and Private John Smith of own company (Company C, Second Dragoons). My company being some distance in advance, I caused the caisson to be opened, and on discovering that it was full of ammunition, I determined to take it on. I and the three (end pg 91) men with me tried to prevail upon some of the Germans to assist us in clearing some of the wounded horses from the harness, but they would not stop. After considerable trouble, my small party succeeded in clearing the wounded horses from the harness, hitching in two more and a pair of small mules I obtained, and moving on, Corporal Lewis and Private John Smith driving, while Sergeant Bradburn and I led the horses. After reaching the retreating troops again I put two other men on the animals, and joined my company with my three men. Before reaching Springfield it became necessary to abandon the caisson in order to hitch the animals to the piece. The was done after destroying the ammunition it contained. Lieutenant Morris, adjutant of Colonel Sigel’s command, assisted me in procuring wagons, which we sent back on the road after the wounded. I am greatly indebted to Sherry Harris, a relative of Lewis Thompson, for adding a great deal of detail and both pictures to the story of this brave cavalryman. Photo courtesy of Sherry Harris. 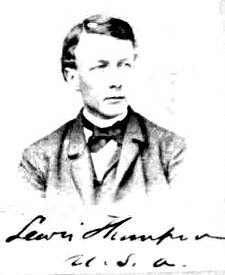 Lewis Tappen Thompson was born in Philadelphia on July 25, 1838. He was the eldest of five children who survived childhood. His father, also named Lewis, was a publisher and member of the Anti-Slavery Society in Philadelphia. He was also part of the Underground Railroad before the Civil War. Lewis was raised in Philadelphia, and educated for a business career. He was working as a cashier and bookkeeper for P. Waples and Co. of Philadelphia when the war broke out. Lewis and his brother James enlisted in Company A, 71st New York State Militia, a ninety day regiment, on April 21, 1861, and mustered out with the rest of the company on July 30th. He served primarily at the Washington Navy Yard, but also fought in the first battle of Bull Run. When the regiment was mustered out, Thompson was appointed a lieutenant of volunteers and assigned as an aide on the staff of Brigadier General John C. Fremont. After Fremont was relieved of command, he worked briefly as an adjutant general for Lane’s brigade before being appointed a captain in the 3rd Kansas Cavalry. Singled out for bravery and leadership in a winter expedition into Missouri for forage, General Lane recommended him for an appointment in the regular army. On February 19, 1862, Lewis Thompson was appointed a second lieutenant in the 2nd U.S. Cavalry and assigned to Company I. He wouldn’t see his new company for nearly a year. He remained at Fort Leavenworth, Kansas for several more months working as a Mustering & Disbursing Officer. He was promoted to first lieutenant on October 28, 1862, but word of the promotion did not reach him or the regiment until the following spring. 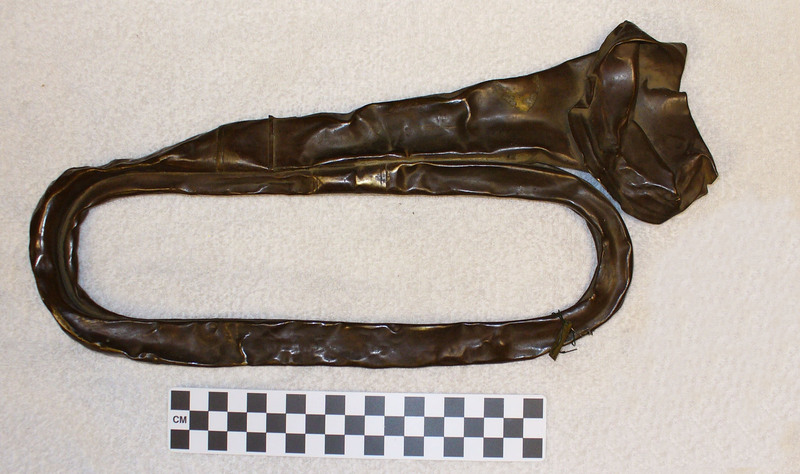 Lieutenant Thompson joined the 2nd U.S. Cavalry at Fort Albany, Virginia in December 1862, where several recently recruited companies were en route to join the regiment. He commanded Company G during the march, then joined Company I upon arrival. He spent the winter on picket duty with his company, based from their winter quarters near Falmouth. Lieutenant Thompson was active in the spring campaign, serving with his company under Lieutenant Thomas Dewees during Stoneman’s Raid and the battle of Brandy Station. 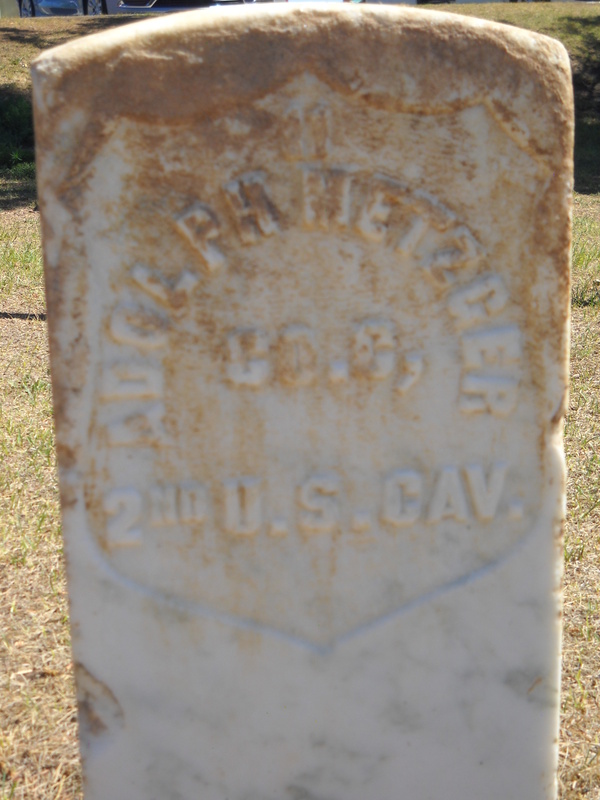 He received a brevet promotion to captain for gallant and meritorious service two weeks later during the battle of Upperville on June 21, 1863. Lieutenant Thompson was captured during the Gettysburg campaign on July 2, 1863 while “attempting to communicate with corps headquarters,” according to brigade commander Wesley Merritt’s report on the battle. He was held at Libby Prison in Richmond until June 1864, then he was transferred briefly to Macon, Georgia and then onward to Charleston, South Carolina. Thompson was exchanged at Charleston, SC on October 4, 1864, and sent to Camp Parole, near Annapolis, Maryland to recover in the military hospitals there. After recovering from his illness and his release from Camp Parole, Maryland, Captain Thompson was assigned to special duty on the staff of Governor Cummings in Golden City, Colorado. He served there from September 25, 1865 until September 1866, when he was ordered to join his company. In the interim, he had been promoted twice. He received a brevet promotion to major for meritorious service during the war on September 25, 1865. On July 28, 1866, he was promoted to captain and command of Company L, 2nd U.S. Cavalry. Thompson continued to suffer the effects of his captivity for the remainder of his life. He took a sick leave of absence from August 16, 1868 to March 29, 1869. He rejoined his company at Fort Ellis, Montana in the summer of 1869. The photo below is from a group picture of regimental officers on a porch at the fort. On February 26, 1869, the President directed that the brevet rank of Colonel be conferred upon Thompson. The reason was not stated. 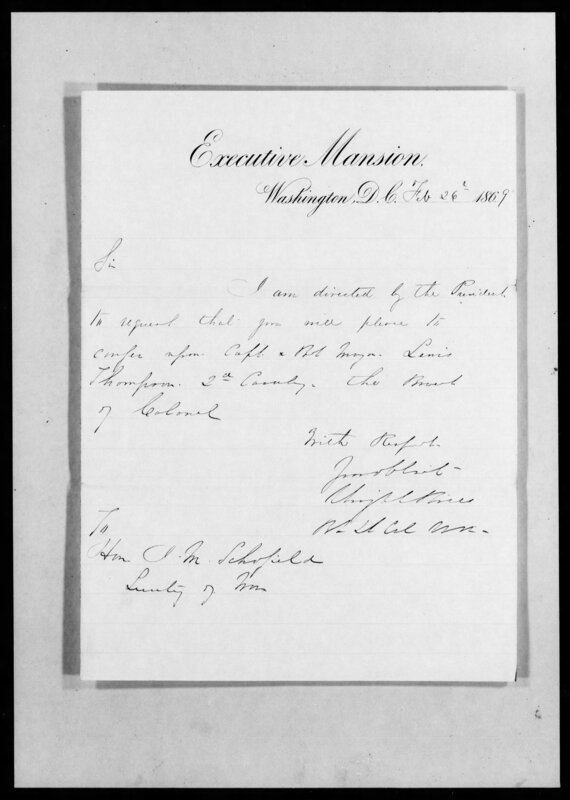 Other than the letter to Secretary of War Schofield directing the promotion on Executive Mansion stationery, there is no documentation of the promotion in his records. Captain Thompson was sent to a retiring board in 1870, but the board recommended him for retention. He proved their judgment in the field, commanding his company during the Piegan expedition under Major E.M. Baker earlier that year. He also led his company in an engagement with Sioux at Prior’s Fork, Montana on August 14, 1872. Despite his illnesses, he remained in touch with the regiment and its former officers. He even wrote a short chapter on the Piegan expedition of 1870 for Theophilus Rodenbough’s From Everglade to Canon with the Second United States Cavalry, published in 1875. Captain Thompson commanded Company L in Major James Brisbin’s battalion of the 2nd Cavalry in Colonel John Gibbon’s column during the Little Big Horn campaign. He was so ill toward the end of the march that he was carried on a stretcher behind a mule with his company. Unfortunately, Thompson’s story didn’t end there. His brother in law, Lieutenant Colonel Rufus Saxton, requested to move his remains home from Montana to be buried with the rest of his family. His request was endorsed by Brigadier General John Pope, commander of the Department of the Missouri, and Lieutenant General Philip Sheridan, but denied by order of the Secretary of War. A year later, Saxton and Lewis’ brother moved his remains to the family plot in Saulsbury Church Yard, Bucks County, Pennsylvania. The cemetery is currently known as Thompson Memorial Cemetery. Heitman, Francis B. Historical Register and Dictionary of the United States Army. Washington: Government Printing Office, 1903. Page 640. Henry, Guy V. Military Record of Civilian Appointments in the United States Army, Volume 2. New York: George W. Carleton, 1869. Page 345. Official Records of the War of the Rebellion, Series I, Volume 27, Part 1, page 943. Rodenbough, Theophilus. From Everglade to Canon with the Second United States Cavalry. Norman: University of Oklahoma Press, 2000. Pages 378-383 and 470. Saxton, Rufus. “The Reminiscences of a Quartermaster in the Early Days of the Civil War,” Pocumtuck Valley Memorial Association, Volume 6 (1921), pages 394-412.